Modern vehicles include more and more electronics. In particular electronic motor regulation, chassis, climate control and driver support systems are increasing rapidly. To provide for efficient error search and localisation of the installed sensors and actuators in case of a disturbance in the electrical system, workshops need to be supplied with all the necessary information. Using a graphic presentation TecRMI now provides not just the circuit diagrams for individual components but also their locations and values as well as the fuses and relays for their power supplies. This eliminates a time-consuming search within the vehicle. After localising the sensors or actuators, which is particularly difficult around the motor, TecRMI now also delivers all measurement values for the diagnosis. The measurement values include the measurement points, expected values and conditions of measurement. In place of standardised representation of plugs and receptacles the graphic shows the actual items with the pin numbers of the connections. Components can be quickly and precisely tested for their electrical functions. Component test is strongly supported so that an error can be more uniquely identified. 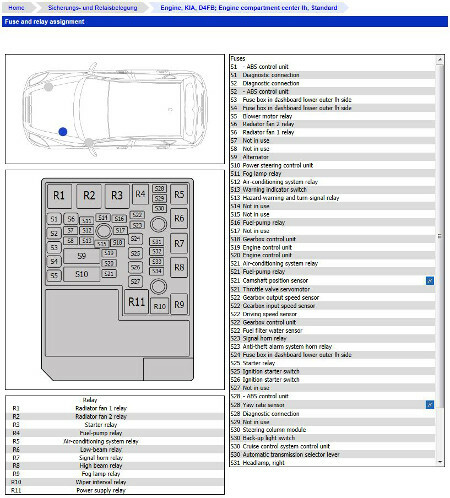 The search for installation points and pin assignments for the constantly increasing number of fuse and relay sockets is also made easier for the TecRMI user by a graphic vehicle overview. This overview shows all fuse and relay boxes and their locations within the vehicle at a glance. 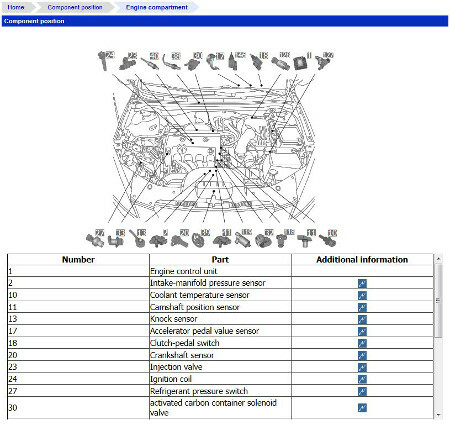 After localising the corresponding unit an interactive graphic shows the precise contents of all pin assignment variants over the entire construction period of the vehicle. A “mouse over” effect shows colours, amperage and positions of all fuses and relays. Localisation and identification in this segment have never been easier. Communication of all the new information including the circuit diagrams in an electronic package is supported by a simple click on the components and symbols. For example after localising a motor component the corresponding circuit diagram can be displayed directly. The TecRMI electronic package opens a new dimension of information provision. Engine bay overview including actor and sensor location. TecRMI diagnostic values explaining measuring points, preconditions and values & tolerances. Location of fuse and relais boxes including detailed content explanation.